After finishing Mockingjay I tried to read several books. I tried to read some general fiction, historical fiction, lighthearted YA, a mystery, and some creative nonfiction. And I couldn't get past a few pages in any of them. Not because they were bad books but because they weren't Mockingjay. So I decided to finally dig out my copy of Gregor the Overlander, the first book in Suzanne Collins middle grade series. I bought this book a long time ago after reading Catching Fire, I think, but never got around to reading it, even after reading some great reviews. I'm glad I read it now, because it was the perfect antidote to what ailed me. 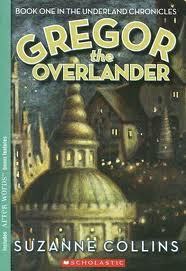 Gregor is an eleven year old boy who lives in New York City with his mom and little sisters. His dad disappeared awhile ago, and while Gregor can't exactly allow himself to hope that his father will return, he hasn't given up that he won't either. One day while doing laundry, Gregor notices that his little sister disappears through a grate in the laundry room, he follows her and they are plunged into the underworld. Which is not Hades, though with the giant sized cockroaches and rats scurrying about it certainly seems like it could be to me! Humans also live in this underland but they are in a place of uneasy peace. They have long awaited a warrior to come and begin to deliver them from the antics of the rats. They suspect Gregor is the warrior, and share a prophecy with him. I really liked this book. It has the same traits as The Hunger Games trilogy, albeit for younger readers. It's funny, imaginative, a world I can easily visualize in my head and characters I learn to feel a tremendous amount of affection for, particularly Gregor and his sister, Boots. Additionally, Collins doesn't avoid or soften the hard issues. She has made clear that she writes books about children and war and this is certainly that. There are scenes of tenderness and loss of childhood innocence as well as other kinds of losses that are written with such aching emotional truth. Gregor is certainly a character to love, he's empathetic and kind, and willing to take responsibility for his foolish actions. He sees the impact of his choices and acknowledges the role he plays in the way things unfold. He's loyal and brave. This is a fantasy and there is a quest! This is generally not my favorite kind of story (quests) but I enjoyed this one. The structure of Gregor the Overlander will feel familiar to readers of The Hunger Games as well, as it's divided into three parts with 9 chapters each. It is written in the third person, though. I have to confess I immediately ordered the other books in the Underland Chronicles and that's all I want to read now. I've heard, though, they get progressively grimmer. Sound familiar?